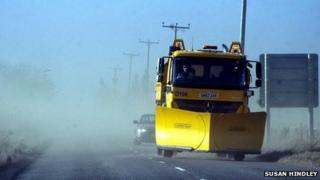 Snowploughs have been used to help clear Moray's roads after sandstorms hit the area. Dramatic images of the sandstorms were captured on Tuesday in areas such as Lossiemouth and Forres. Some roads were blocked and others were passable only with care due to sand, soil and trees. A Moray Council spokesman said: "Some roads are likely to be affected by sand for some time to come and we would urge motorists to take extra care."